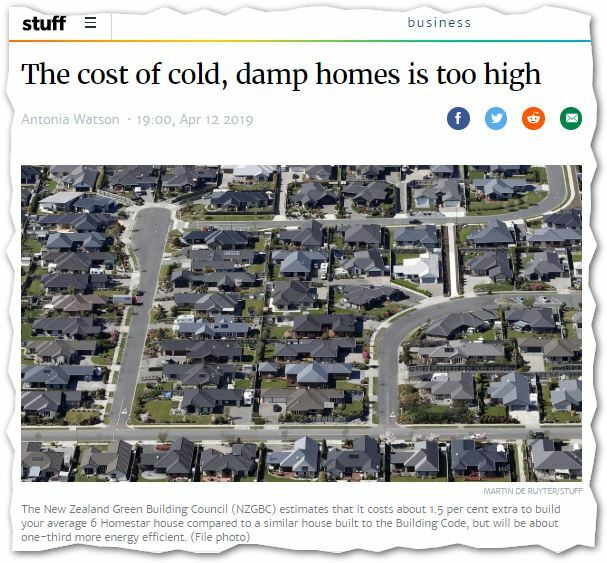 12 April 2019 Stuff’s Antonia Watson: The cost of cold, damp homes is too high | Sustainable Engineering Ltd.
“Generations of homes have been built that are unsuitable for the New Zealand climate. According to research by the Building Research Association of New Zealand, about half our houses aren’t adequately insulated (47 per cent), have insufficient heating (46 per cent), and are damp and show visible signs of mould (49 per cent). Both the International Energy Agency and the OECD have found our Building Code – the minimum legal standard to which homes have to be built – to be below the standards required in many other countries. “According to health statistics, 20 New Zealand children are dying every year, while another 30,000 are hospitalised from issues related to poor housing. 30,000 hospitalisations per year for issues related to poor housing. Imagine how that feels: For the parents that take their kid to hospital and are told that their home is going to make it worse once they taken them home; For the doctors and nurses who see the same kids over and over again and have to send them home to the housing that will make them sick all over again. We pay for bad design and construction choices in high energy bills but these kids pay with their lives.